Let’s see some of the amazing facts and Health Benefits of Jicama here on this page. Jícama Botanical name: Pachyrhizus erosus, is a species in the genus Pachyrhizus in the bean family plant and refers to the plant’s edible tuberous root. It is a round, fleshy taproot vegetable fruit. It is also known as Mexican yam bean, or Mexican turnip is the name of a native Mexican vine. It is a delicious, sweet-tasting and crunchy food similar to a sweet potato, though without edible skin. It looks Very similar in texture to a turnip and have a taste closer to an apple fruit. Jicama fruit is also grown in many parts of Central American, South Asian, Caribbean, and some Andean South American regions. This little-known tube is grown in the warm climates of Central America, the Caribbean, the Andes Mountain regions, and Southern Asia, where it’s an important as well as extremely versatile food source. Only the root portion of jicama is edible. Jicama is one of the very low-calorie root vegetables; carrying only 38 calories per 100 g. Being low in Calories it plays an important role in weight management. Being high vitamin C content, jicama is great for boosting the immune system, supporting eye and skin health, and helping with anti-inflammatory action in the body to reduce everything from arthritis to a stuffy nose and watery eyes. It has a unique mixture of vitamins, minerals, phytonutrients, and other organic compounds, including dietary fiber, vitamin C, vitamin E, folate, vitamin B6, pantothenic acid, potassium, magnesium, manganese, copper, iron, and a small amount of protein. Jicama is full or potassium, calcium, and magnesium – all important trace minerals for our sustained health. Jicama is naturally high in fiber, with 6.4 grams per 1-cup serving. This means that one serving of jicama has 25 percent to 30 percent of the recommended intake of fiber per day for women, and 17 percent to 21 percent of the recommended intake per day for men. 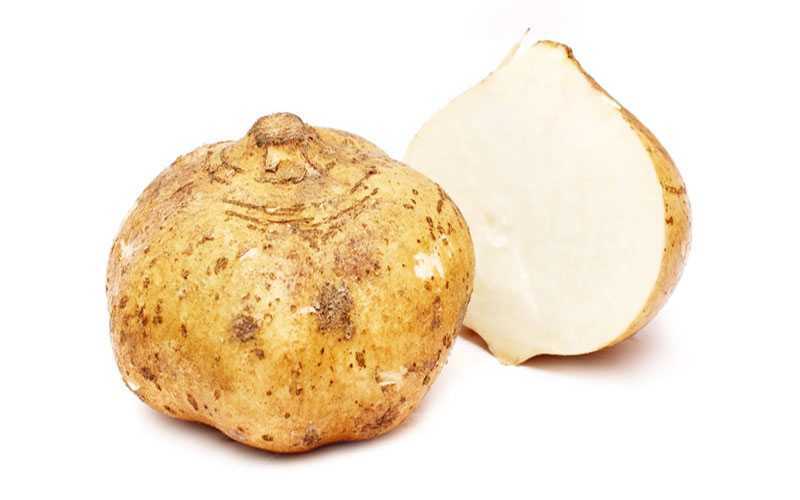 The most interesting health benefit of jicama fruit is the inulin, which studies have shown can protect against osteoarthritis, and have a positive impact on colorectal cancer, especially when eaten during its early stages. The significant amounts of copper and iron found in jicama make it very good for maintaining the health of the circulatory system since those two minerals are important elements of red blood cells. Raw jicama has a sweet succulent apple like fruity taste. In many parts of Mexico, fresh tubers are cut into cubes/sticks and sprinkled with lime juice, salt and dressed with olive oil and paprika or ground chili pepper and enjoyed! Apart from salads, another popular oriental dish that uses jicama and turnips is popiah, a Fujian/Chaozhou-style fresh spring roll.